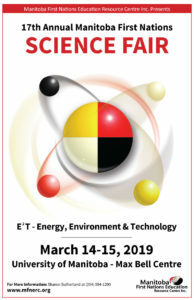 The Manitoba First Nations Science Fair, presented annually by MFNERC, serves to support the networking of First Nations schools in the area of science. It is designed to encourage the schools and students to first develop and participate in their own local science fairs, and then attend the provincial gathering in Winnipeg. It also aims to increase the awareness of, interest in, and attention to science in First Nations Schools; improve the amount and quality of science being experienced by First Nations students; and demonstrate that: science is fun, science is all around us in everyday things, science includes all the other subjects, and science can be understood by everyone.